By Xah Lee. Date: 2011-10-07 . Last updated: 2017-05-09 . As Chicago Mayor Harold Washington said of the corrupt former Mayor Daley, “I'm not glad he's dead, but I'm glad he's gone.” Nobody deserves to have to die - not Jobs, not Mr. Bill, not even people guilty of bigger evils than theirs. But we all deserve the end of Jobs' malign influence on people's computing. Many FSF advocates are offended by this. I hold slightly positive view of Steve Jobs. (been a dedicated Mac fan from 1991 to 2005) Am slightly sad that he died. However, am not offended by RMS's remarks. Everyone dies. In my moral book, it's not more wrong to criticize when a person just died; whether the person is alive or just died SHOULD NOT make any difference. 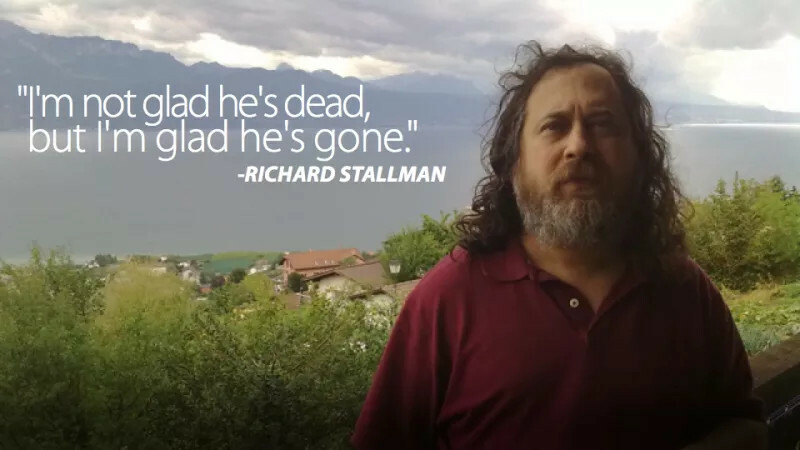 Also, it's his personal blog, not on fsf.org or gnu.org. Your opinion about a person should not change when he's dead. If, when he is dead, you suddenly say nice things (which is in general pleasing to the public), you are to some degree a lier. That's what politicians do. It's not too surprising of RMS's behavior neither. He's been like that in past few years. Screeching publicly against all smart phones (iPhone, Android), attacking cloud computing, attacking Google, made enemies with many major figures in the open source community, got kicked out by several linux communities afaik (For example, debian), and calling the Gnome creator Miguel de Icaza a traitor. He, seems to have lost touch, becoming bitter old man, his GNU software suite getting less and less relevant, and i don't see he's getting any more followers neither.